WASHINGTON - Six days away from a potentially calamitous government default, House Republicans appeared to be coalescing Wednesday around a work-in-progress plan by House Speaker John Boehner that would increase the U.S. borrowing limit and chop $1 billion in federal spending. But Senate Democrats labeled the GOP proposal a non-starter  a short-term solution that would leave the economy on shaky footing. Each side tried to claim the moral high ground in a standoff that has put financial markets on edge. Boehner, R-Ohio, set out to retool his plan after nonpartisan analysts in the Congressional Budget Office said his proposal would cut spending less than advertised  about $850 billion over 10 years rather than the $1.2 trillion initially promised. GOP leaders planned a House vote Thursday on the reworked plan. Is August 2 really the debt D-day? "We're moving in his direction in a big way today," Rep. Mike Rogers, R-Mich., said of Boehner's plan. Rogers and others cited changes being made in the bill to make sure spending cuts exceed added borrowing authority, and the fact that the House will soon vote on a balanced budget plan. Senate Republican Leader Mitch McConnell said only Boehner's plan would resolve the crisis "in a way that will allow us to avoid default without raising taxes and to cut spending budget gimmicks." But Sen. Charles Schumer, D-N.Y., said Boehner's proposal "remains a nonstarter in the Senate, and the president will never sign it." A rival proposal offered by Senate Majority Leader Harry Reid, D-Nev., would deliver savings of a little more than $2 trillion, a half-trillion less than promised but still more than under Boehner's plan, budget analysts reported. Reid said Boehner's original plan was so weak that it "didn't even have the support of Republicans in his own chamber." "A short-term solution is not an adequate solution for our economy," Reid said. "It's not Democrats who have asked for a long-term solution. It's the economy. The economy has demanded it." House Democrats, for their part, focused on finding a fallback plan should the two sides fail to raise the debt ceiling before the government runs out of borrowing authority next week. Rep. James Clyburn, a member of the Democratic leadership, said he told fellow Democrats that Obama should veto the House GOP plan for a short-term extension of the debt ceiling and invoke the Constitution's 14th Amendment, which says that the validity of the nation's public debt "shall not be questioned." The White House has rejected resorting to this tactic, questioning its legality. But Democratic Caucus chairman John Larson said that with only days left before Treasury's borrowing authority lapses, "we have to have a failsafe mechanism." Amid all the heated rhetoric, it was easy to miss the fact that the differences between the sides were narrowing. Boehner's plan represents significant movement from a bill the House passed last week, this one requiring less of the long-term spending cuts that had made Democrats balk. And Reid no longer is insisting on having tax increases, anathema to Republicans, as part of any plan to cut deficits. Boehner needs to do more than pump up the legislation, however. He has to shore up his standing with tea party-backed conservatives demanding deeper spending cuts to accompany an almost $1 trillion increase in the government's borrowing cap. Many conservatives already had promised to oppose it. 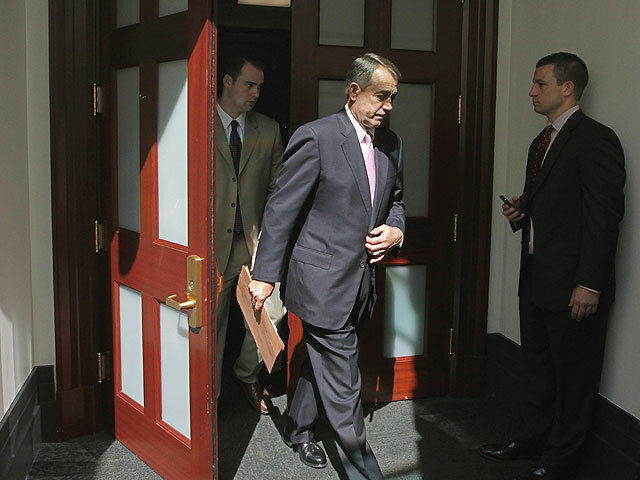 Rep. Alan West, R-Fla., said Boehner's bill was picking up support even among conservatives. "Nancy Pelosi, Harry Reid and President Obama are going to be surprised tomorrow night," he said. "I'll bet my retirement check on it. I'm a conservative. I'm going to support this." Rep. Bill Huizenga, R-Mich., said he remained undecided, but predicted that the reworked Boehner plan was "about as good as it's going to get. That's a pretty strong argument." Unless he can wrestle the situation under control, Boehner risks losing leverage in his dealing with Obama and the Democrats who control the Senate. Reid said the original plan was destined to fail in the Senate and it drew a White House veto threat. But it was nevertheless framing the debate over how to reduce long-term deficits while raising the debt ceiling. Tuesday's CBO analysis said the GOP measure would cut the deficit by about $850 billion over 10 years, not the $1.2 trillion originally promised. Even more embarrassing was a CBO finding that the measure, which would provide a $900 billion increase in the nation's borrowing cap, would generate just a $1 billion deficit cut over the coming year. Boehner's plan would couple budget savings gleaned from 10 years of curbs on agency budgets with a two-track plan for increasing the government's borrowing cap by up to $2.7 trillion. The first increase of $900 billion would take effect immediately; the second increase could be awarded only after the recommendations of a special bipartisan congressional panel are enacted into law. The White House says Boehner's measure would reopen the delicate and crucial debt discussions to unending political pressure during next year's campaigns and risk more uncertainty in the markets. Reid held back on forcing a vote on his competing measure, which he unveiled Monday to poor reviews from Republicans, including McConnell of Kentucky. Reid appears to hope that his measure, which promises $2.7 trillion in spending cuts and would increase the debt limit enough to keep the government afloat past the 2012 elections, could emerge as the last viable option standing and could be modified with input from Republicans. Those same Republicans blasted Reid's bill for $1 trillion in war-related savings, calling the projections phony. One area of potential compromise could be how to treat the findings of a bipartisan congressional commission to identify further deficit reductions, especially in major health care programs such as Medicare and Medicaid. Both Reid and Boehner support the idea, though Boehner wants to make a future increase in the debt limit contingent on the proposed additional cuts being enacted into law. Meanwhile, the clock was ticking down to next Tuesday's deadline to continue the government's borrowing powers and avert possible defaults on U.S. loans and obligations, like $23 billion worth of Social Security payments due Aug. 3. A possible hit to the country's credit rating, which is seen as increasingly likely regardless of whether a deal is struck, could be felt by average Americans. "If the credit rating agencies downgrade Treasury debt [they] will also downgrade the debt of other institutions, the Fannie Maes and Freddie Macs and it's important for the mortgage rates we pay," Mark Zandi, Moody's chief economist, told "The Early Show" Wednesday. "They'll downgrade the debt of various banks; they'll downgrade the debt of state government and other municipalities. So we'll all be paying higher interest rates. I don't think rates would rise overwhelmingly but they would rise. For example instead of paying 4.5 percent or fixed rate mortgage you might be paying 4.6 percent [or] 4.7 percent." Zandi added that the root of the possible downgrade rested solely in Washington. "We're very prosperous nation. We can pay our bills. We just need to have the political resolve to do that, so it's not the economy. It's not economics. It's politics." The Capitol's telephones were jammed after Obama urged the public to contact their representatives in his Monday night address. Conservative bloggers and groups like the Club for Growth, which funds primary campaigns against Republicans it deems too squishy in their conservatism, denounced Boehner's bill as too weak. The U.S. Chamber of Commerce, closer to the GOP mainstream, urged support. While Boehner searched for votes, some Americans seemed to edge closer to the notion that the Aug. 2 deadline might pass without a solution. California planned to borrow about $5 billion from private investors as a hedge against a possible federal government default.